Rasped and worm-holed distressing are used to achieve a look that one would think had been there for years and years. 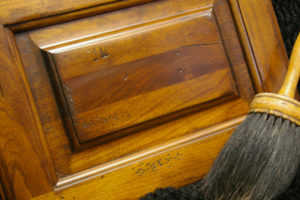 Ordinary cabinet door made to look like weathered barn board. This look can be achieved on any style cabinet but looks best on flat profiles. 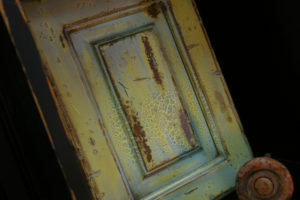 Although not your typical distressed cabinet finish. We wanted to include the rust reactive paint because it is a very cool finish. 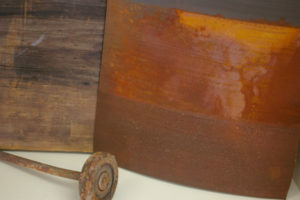 This process simulates old rust patina finishes and can be applied on any substrate: wood, walls, interior or exterior, to achieve an old rust look. The upper portion seen in the photo, currently in it’s raw state, will continue to react to temperature changes for years to come. The lower portion has been clear coated to stop the reactions caused by temperature changes, this color will not change. 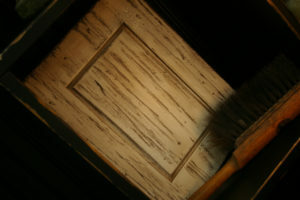 This process is achieved by using multiple colors, distressing the wood using rasping techniques give the appearance of hundreds of years of aging. A spot release technique produces a layered look while a crackle medium in random areas creates a timeless, old, weathered look and feel.